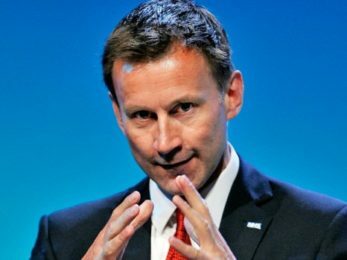 Offered a move to the business department yesterday, Jeremy Hunt convinced the PM that though the NHS is on its knees, it still needs at least one more big push before complete privatisation is guaranteed. Mrs May accepted that Hunt was doing a cracking job of buggering up the health service but was worried some sick and disabled people might survive, so she’s extended his brief to include reforming social care. “There’s no escape for them now.” muttered an ebullient health secretary this morning, just before a news conference began. A spokesperson for the BMA said later “Not fully buggered it up? He’s quite mad of course – mad is a technical word for people with massive delusions. If we had enough staff we’d send a couple of psychiatrists over to the Department of Health this afternoon. Pingback: “Jeremy Hunt on his decision to stay: ‘I haven’t fully buggered up the NHS yet’” | Evening Harold | COMRADE BOYCIE: VIVA THE ANTI-TORY/BIG BROTHER REVOLUTION!